My Kinda Art: it's the most wonderful . . .
it's the most wonderful . . .
Hello and welcome! I'm back with another holiday card. I created this one for Linda Coughlin's inspiration challenge "12 Tags of Christmas Funkie Junkie Style". This annual event is sponsored by her store, The Funkie Junkie Boutique. You can get all the details and challenge requirements on this blog post. My take on Linda's tag for Week #7 was inspired by the her beautiful plaid background and the stamped greeting that she used. All of my supplies are designed by Tim Holtz. See you soon and thanks for stopping by! Great take on seventh week, love the wood slice and the chalk effect! Fabulous! I absolutely adore this, Deb! 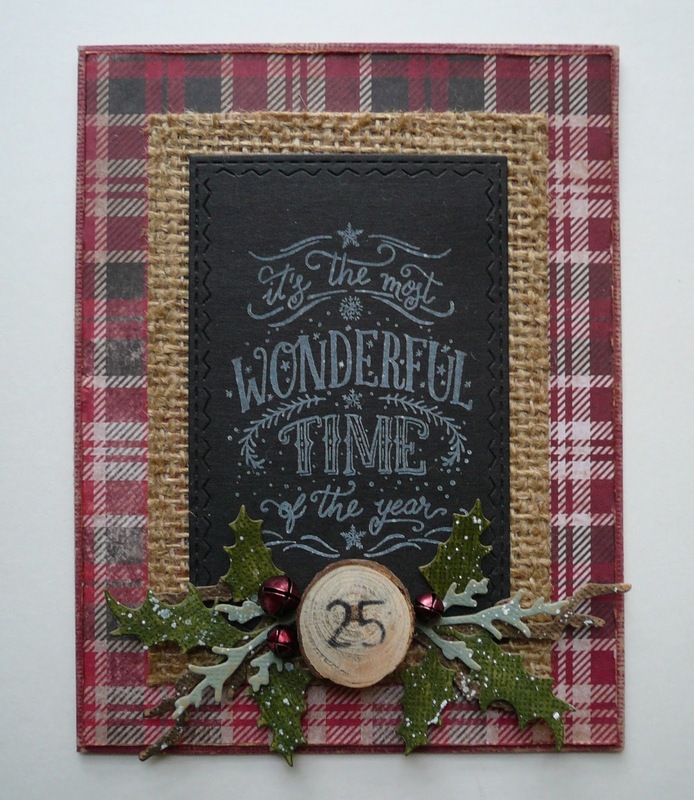 Really love the chalkboard effect against the burlap and the 25 stamped on the wood cut. Lovey greenery spray tool. I am seriously drooling over this card. Thank you so much for sharing it with my visitors for week #7. I'm sorry it's taken me so long to get around to visit. Life is crazy at this time of year. I love the rustic look to your card! I couldn't figure out what to do with those tree slices, but you sure have used it well here with the plaid, burlap and chalkboard. Fabulous!